Joan K. Lacy is a weaver of words, ancient cultures, mysteries, action and adventure. Raised in the country outside San Diego, an adventurous spirit encouraged her to take every opportunity to explore all this fascinating world has to offer. She now combines her love for archaeology, history, and action adventure fiction with her active imagination to create a world filled with action and adventure, with a touch of magic. You won’t want to miss these adventures with Alex Cort and his friends. Joan K. Lacy is a weaver of words, ancient cultures, mysteries and adventures. Raised in the country outside San Diego, an adventurous spirit encouraged her to take every opportunity to explore all this fascinating world has to offer. She now combines her love for archaeology, history, and fantasy fiction with her active imagination to create a world filled with all sorts of magic and adventure. You won’t want to miss Alex Cort and his friends on their many adventures. 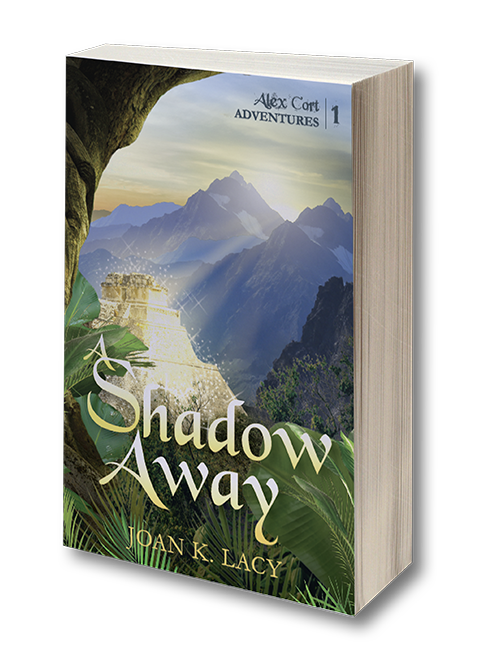 Joan K. Lacy's highly anticipated book, A Shadow Away, is now available! Sign up now to get the first two chapters free! Plus, as a fan, you'll get exclusive updates and bonus material, as well as Joan's blog, and details on future books in Alex Cort Adventures series. Don't miss a single update! Fans of magical realism like Madeleine L’Engle’s A Wrinkle in Time, or who like Clive Cussler with a touch of magic will love the world of Alex Cort’s first action adventure. If you’re a fan of Indiana Jones, and a quest like the Lord of the Rings, the race to the finish will have you clamoring for more.